RICHMOND, Va. — Gov. Ralph Northam of Virginia, abandoned by allies in the Democratic Party and besieged by demands that he resign, met with his cabinet on Monday as state legislators returned to a Capitol thrown into chaos by the governor’s insistence on staying in office despite revelations that a photograph showing people in blackface and Ku Klux Klan robes was displayed on his medical school yearbook page. As Mr. Northam dug in, his onetime allies in the state and national Democratic Party intensified their pleas that he quit, angry and embarrassed at the prospect of being saddled with a governor suddenly compromised by his past. While denying he posed in the racist costumes depicted in his 1984 yearbook — after initially acknowledging it — Mr. Northam admitted on Saturday that in the same year he had used shoe polish to darken his face for a Michael Jackson-themed costume at a dance party. Stunned state legislators arrived Monday for their weekly session uncertain who would be governor by the end of the day. Swarmed by reporters, Kirk Cox, the Republican speaker of the House of Delegates who has called on the governor to quit, said that he did not want to pursue impeachment against Mr. Northam and that it was uncertain if the matter met the threshold for impeaching him. Mr. Cox’s remarks heartened Mr. Northam’s advisers, who said on Monday that the governor was intent on remaining in office and trying to prove somehow that he was not in the photograph. 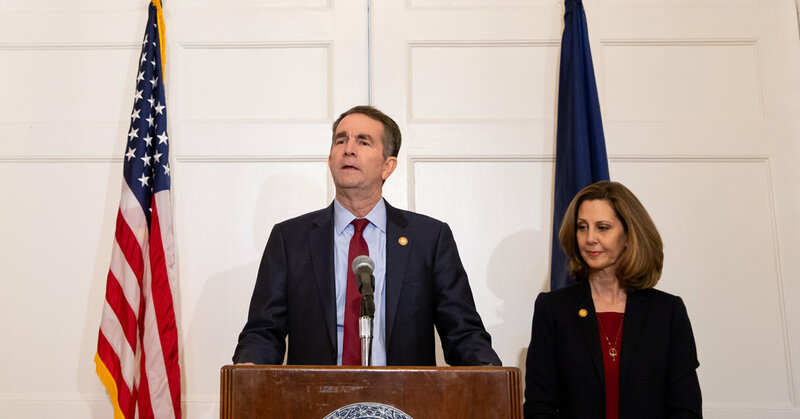 But the governor, already isolated from Virginia’s political leaders, was fast becoming a pariah outside Richmond, too, after a wave of top Democratic leaders, including most of the contenders for the 2020 presidential nomination, called on him to resign. Mr. Fairfax’s aides — his chief of staff, Lawrence Roberts, and his communications director, Lauren Burke — said The Washington Post had investigated the claims around the time of the lieutenant governor’s inauguration last year but did not publish an article. The Post published an article on Monday explaining its decision. By Monday morning, Mr. Northam had spent more than 60 hours in deepening political isolation, abandoned by Democrats who quickly came to see his diminished standing as a burden on two fronts: their policy agenda, including matters like teacher pay and tax policy, and their efforts to capture control of the House of Delegates and the Senate this year. Both chambers are within reach for the party, which has made gains throughout the state in recent years. “It has created a dark cloud,” said Mark L. Keam, a legislator from Northern Virginia who was among the Democrats afraid of a loss of leverage as long as Mr. Northam remained the titular head of the party in Virginia. This week is among the most crucial for the General Assembly, which faces an all-important deadline for bills to advance. Mr. Northam, who attended his longtime church on Virginia’s Eastern Shore on Sunday morning, has commented publicly just three times since the photograph emerged online on Friday. He first issued a statement on Friday, when he said he was “deeply sorry for the decision I made to appear as I did in this photo and for the hurt that decision caused then and now” and indicated that he would seek to serve out his term, set to expire in 2022. A video message released a short time later reiterated the governor’s position. Mr. Northam’s shift did little, if anything, to stanch the calls for his resignation; some Democrats believe it lent them even greater credence and urgency. Some Democrats, like Mr. McAuliffe, have maintained their belief that Mr. Northam would resign and stanch speculation about whether other state officials might try to remove him through impeachment or the Virginia Constitution’s version of the 25th Amendment. But then he mentioned how electing someone to be lieutenant governor was, on the part of voters, an act of faith that the victor would be ready to assume the state’s top office, if necessary. “He’ll be ready to do that,” Mr. Northam said.